After waiting 7 months for the delivery of the POD ( built to order) it finally arrives last week. 4 big boxes on two pallets. 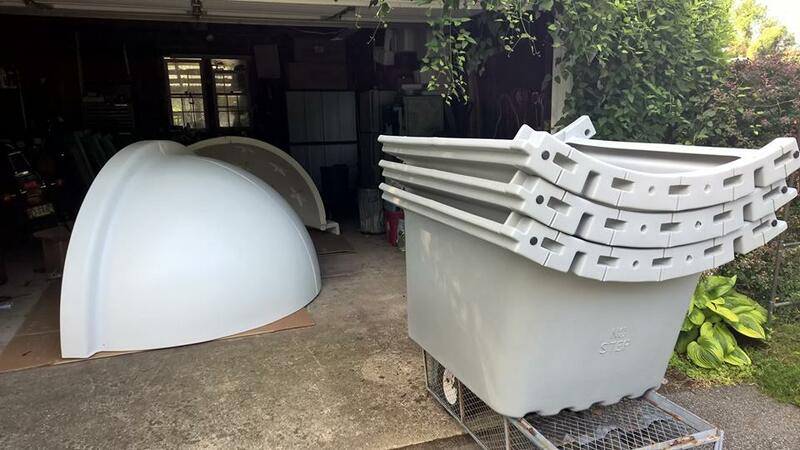 The dome comes in 4 pieces, 2 quadrants for the primary dome half and 2 for the secondary dome. In use the secondary dome slides up under the primary half. Assembling the dome halves and applying the hardware and weather seals was the most time consuming process. I spend part of day one to bolt the quadrants together and seal the seams with Lexel silicone sealer. I let it set up over night before continuing. The next day I applied the aluminum plate to the bottom of the flange of the primary that rides on the rollers that will be inserted on top of the side panels. I also applied the seal the closes the gap between the primary dome and secondary dome. 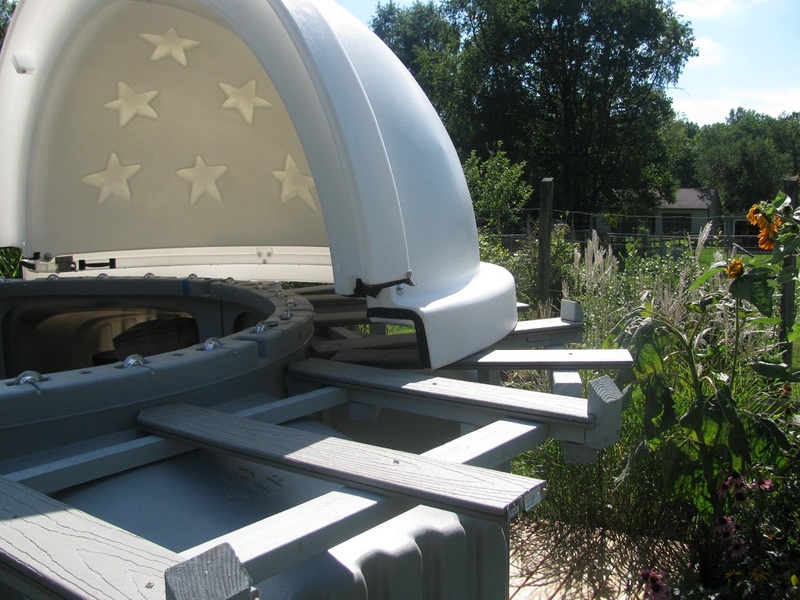 Having completed the assembly of the domes we moved the side panels out to the telescope deck. The assembly of the wall panels went rather quickly. Some of the blot holes didn't quite line up but we persevered. 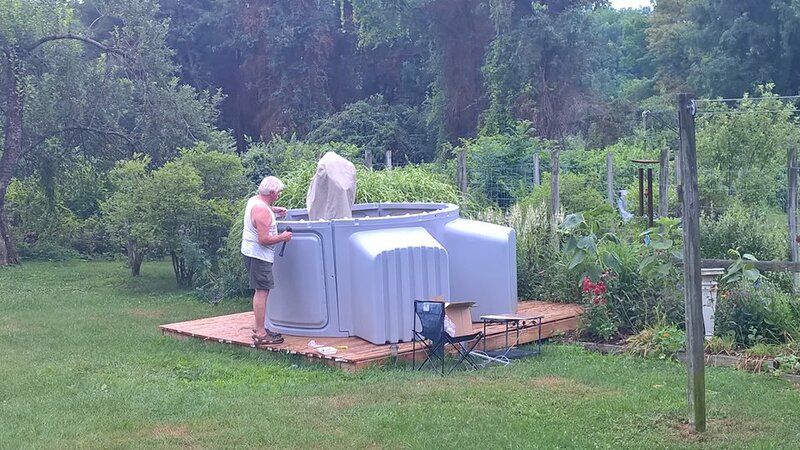 It took a couple of hours to get the sides bolted together and the primary dome in place. Once the Primary dome was secured in place, we added the secondary. After about 4 hours we had it all buttoned up just before the rain started. The only thing lest to do is finish bolting it to the deck and adding some additional weather stripping where the two halves meet at the bottom corners. That can wait till it stops raining. Though the POD very well engineered it has one drawback, you are unable to image close to the zenith because the dome is in the way. 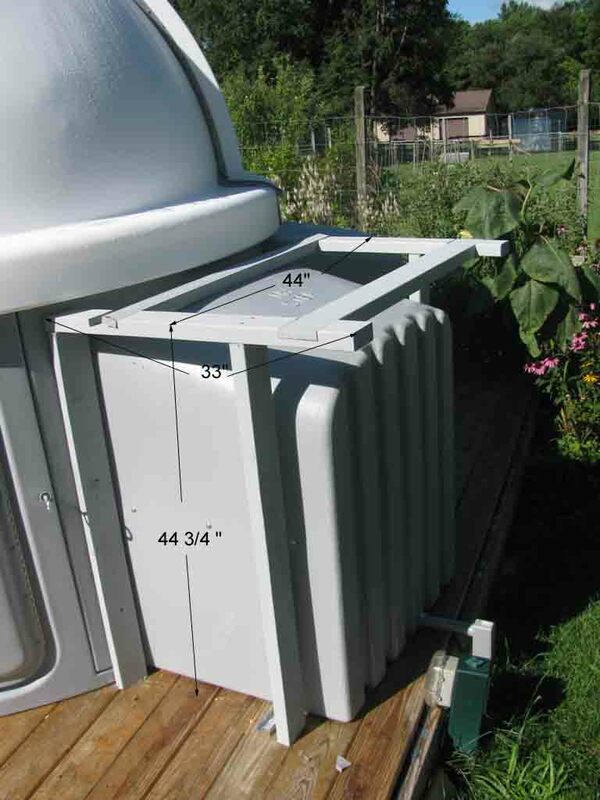 SkyShedPod has an accessory called a PZT. It's a table that allows you to push the POD dome off the sides and out of the way. The Table is made of marine plywood. The drawback I see to the PZT is that it will collect snow in the winter and is limited in size. You can only push the dome off in one direction. I decided to follow the example of another POD owner who built and extension frame in a spoke fashion that allows him to push the pod off in multiple directions and since it's a spoke it will not accumulate snow in the winter. This owner built his frames out of 4x4 lumber which I thought was over kill, since the dome isn't that heavy. I opted to use 2x4 construction instead and after completing the project figured that 2x3 would be sufficient. Since I have a 3 bay pod I decided to extend the frames over each of the bays. Here is a picture of one of the side frame members . 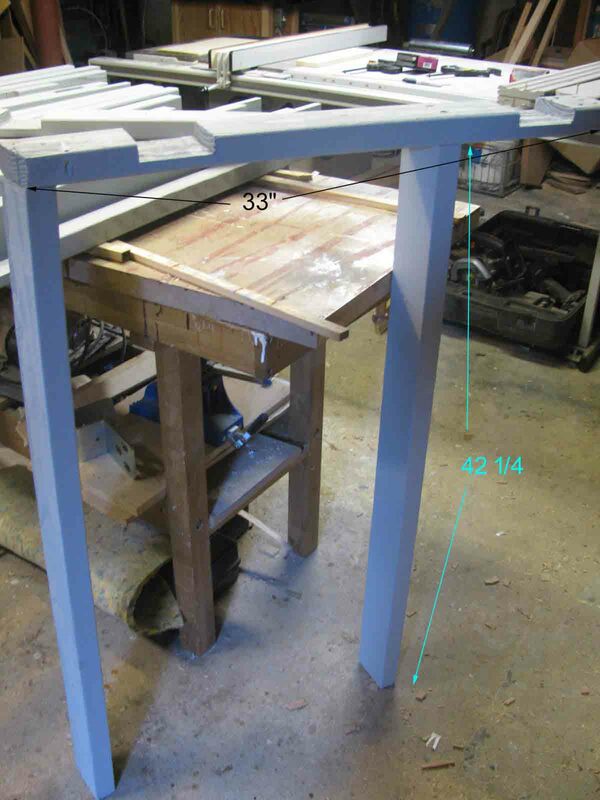 The frame is 42 1/4" tall to provide enough clearance for the 2x4 top rail and the 1" composite decking on which the dome will slide. This will bring the composite board about 1/4 below the edge of the dome. The top member is 33" long 2x4 ( you can make it as long as you need). I used half lap joints cut into the top member to allow for the two cross pieces that will connect the two side frames. Originally I had intended to use 2x4's for the cross members but found out that the top of the bay would interfere with the upper 2x4 so I ended up using 2x2 up close to the dome and a 2x4 at the fare end. . The top frame was cut at a 15 degree angle to follow the curve of the dome. The frame is attached to the dome with 2" screws that are screwed thru the dome and into a 2x4 backer on the inside of each bay. With all the frame members fastened with the 3" construction screws I topped them with the composite deck board. This is what the finished frame looks like so far. I still need to add some stops to the ends of the frames to keep from pushing the dome over the end and I may also add a piece of decking between the bays for additional support. Stops added. Now waiting for the quick disconnect rollers assembly so I can actually test this out. Quick disconnect hardware in place and now the roof is easy to slide off.